We spent over 120 hours over a 60 day period researching and testing more than 20 different types and brands of hairball remedies for cats and found that results, cost, and preventative capabilities were most important with cat owners who were shopping for hairball remedies. Laxatone in Tuna for Hairball Relief scored high marks in all categories and is our overall top pick. Tomlyn Laxatone Gel has been around for over 35 years and is a trusted source for taking care of hairballs. It is made with vegetable oil and mineral oil that is in a gel that is flavored with tuna. The purpose of this gel is to lubricate the digestive tract of your cat enabling him to pass cat balls rather than coughing them up. Cats are known for keeping themselves groomed. They spend a lot of time licking themselves to keep their coats smooth. The problem with this constant cleaning is that they swallow a large amount of hair in the process. Cat hair does not make its way easily through your cat’s system. Some of it is eliminated through the stool but the rest forms what is known as a hairball and the only way the cat can get rid of it is to throw it up. The occasional hairball is not abnormal at all and should not be anything to worry about. If you notice that your cat is having them often there is a danger of these hairballs causing a block within the digestive system. There are several things you can do to reduce the amount of hairballs your cat has to deal with. There are many types of hairball remedies on the market that a cat owner can use to help their cats with this common problem. With so many to choose from, deciding on one could be overwhelming, especially if you are not familiar with these remedies. We’ve provided a couple of helpful tools you can use to sort through this large amount of options so you can find the right one for your cat. Below are three reviews of top-rated hairball remedies that are very popular with cat owners. These three selections are quality products that have been proven to work well to reduce the amount of hairballs your cat has to deal with. Any one of them would be a great choice for helping your cat deal with these annoying occurrences. In addition we have included a buying guide that will give you some important information on the types of hairball remedies as well as the danger signs to look for that may indicate your cat has a blockage or problem from these potentially dangerous balls of hair. If your cat is dealing with hairballs frequently or is struggling with constipation due to frequent hairballs you will need to do something about it quickly so it doesn’t escalate to a problem that you need a veterinarian for. Tomlyn Tuna Flavored Laxatone Gel is the perfect product to help your cat by providing a laxative that will resolve the problem. 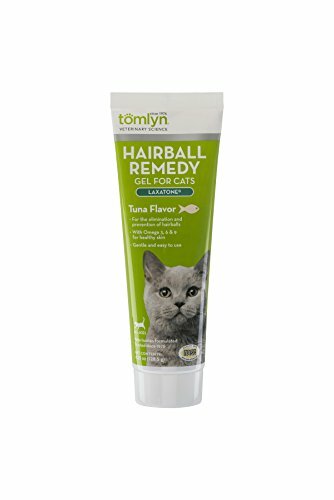 Tomlyn’s has been a trusted hairball remedy for over 35 years and works to gently and safely relieve this problem for your cats. It is made with vegetable and mineral oils that are disguised in a tuna-flavored gel that works by lubricating the digestive system so he or she can pass the hairballs safely rather than having to cough them up. Other available flavors include chicken, maple, and catnip. With over 450 customer reviews and a 4 star rating, this product is a favorite with cat owners because it works. Despite its thinner consistency, this product will work well to help your cat and features a 100% guarantee that you will be satisfied or your money back. Prevention is always preferable than correcting a problem after the fact. If you can prevent hairballs your cat will be a lot better off. 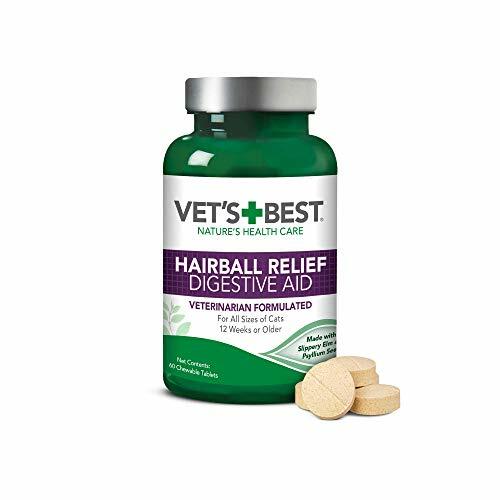 One of the best hairball prevention products you can give your cat is Vet’s Best Hairball Relief Digestive Aid. This effective product is made from several all-natural ingredients including marshmallow root, psyllium seed, slippery elm bark, and papaya. 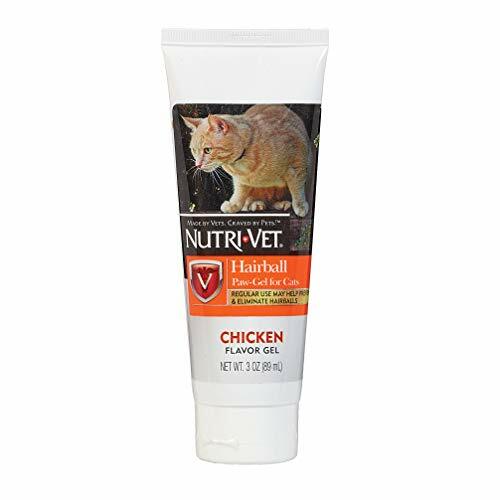 This popular hairball prevention aid lubricates hairballs and supports your cat’s system so the balls of hair pass easily through their system without causing blockages. The formula used in Vet’s Best does not contain any ingredients that are petroleum-based and features a delicious chicken flavor that cats love. Each bottle of Vet’s Best hairball digestive aid contains 60 tablets that will provide 30 days of hairball protection and prevention. They are very easy to give to your cat as well. In most cases, all you need to do is break the tablet into pieces and feed it to your cat two times each day. If your cat does not eat it easily you can mash it up and mix it with some canned cat food. Nutri-Vet Feline Paw Gel is the perfect product to lubricate the digestive tract and minimizes shedding that can cause problems with hairballs. The natural ingredients include oils and lubricating ingredients that are petroleum-free. Petroleum products have been shown to cause problems in some cats so it is better to look for products like this one that will be safer and better for your cats. Nutri-Vet is a thick gel that is very easy to give to your cat and comes in two flavors: salmon and chicken. Most cats love the flavor and will lick it right off their paws if you place a little of the gel on. You can also put it in with their food as well. This 4-star hairball remedy has over 900 reviews on Amazon and is one of the most popular hairball preventions and remedies available. Not only will this product keep the digestive system in line it is good for their coats and skin too. These three top-rated hairball remedies are some of the best available. Each one of these products works to lubricate the digestive tract as well as improve the coat and skin and reduce shedding. All of these benefits reduce the amount of hairballs your cat will have to deal with. Taking the time to find the best product you can for your cat’s health will reduce the chances of them having a blockage which can be fatal if not treated. Vet bills can be very expensive and going to the vet is stressful for your cat. The right products, such as these three top-rated ones, will prevent as many hairballs from forming so your cat will be more comfortable and healthier too. If you are ready to purchase a hairball remedy for your cat, consider one of these three top-rated products. If these are not what you’re looking for, we have added 7 more selections for you to consider. All cats get hairballs. This natural occurrence happens from the routine self-grooming that cats do every day. Once the cat swallows loose fur the fur gets stuck in the stomach and forms a ball. Most hairballs can pass naturally but sometimes the cat has difficulty passing it naturally and will cough it up. Cleaning up coughed-up hairballs is not pleasant and having them is not pleasant for your cat either so doing what you can to reduce these hairballs benefits both you and your cat. The good news is that frequent hairballs can be prevented with the right nutrition, grooming, and lubricating products. Brushing your cat on a regular basis helps reduce the amount of hair they will ingest which is just one way to reduce this problem. Below we have listed several of the common causes of hairballs and what you can do to deal with these causes to help your cat. Stress and too much grooming – A stressed cat will usually spend a lot of time grooming itself; sometimes so much that they will cause bald spots on their fur. If your cat is in pain you may notice them over grooming the area where the pain is located. Both of these actions result in the cat swallowing a lot more hair than normal which increases the amount of hairballs the cat has to deal with. Pay attention to your cat’s stress levels and do what you can to improve their well-being and home life. If you notice your cat focusing on one specific area a lot, you may want to get them checked out by the vet to rule out illness or injury. Excessive hair – You may notice that long-haired cats have a bigger problem with hairballs than short-haired cats. One of the best things you can do for a long-haired cat is to brush them regularly with a proper grooming tool that removes excess hair. Doing this on a daily basis will lessen the amount of loose hair your cat will swallow when they groom themselves. Daily brushing will also improve the condition of their coats and will make it much more comfortable for them. Bowel disease – If a cat has a bowel disease their GI tract will not function properly. This can show up as lack of lubrication, lack of the enzymes needed for digestion, or motility. When things are not moving properly through the system hairballs are likely to develop. If your cat is having a lot of problems with hairballs you will want to get the vet to rule out any GI diseases that could be contributing to the problem. GI cancers also prevent contents from moving through the system properly. Surgery may be possible for cats that have GI cancer that is blocking the tract. Lack of Water – Cats get the majority of their water from the food they eat. If you only feed your cat dry kibble your cat is probably constantly dehydrated. Not having enough water in their systems can cause a host of problems. Consider adding wet food to their diet as well as a hairball remedy that lubricates the intestinal tract. Always make sure your cat has plenty of fresh, clean water available. Below we have listed several of the most notable hairball symptoms that your cat may exhibit. Knowing what to watch for can help you identify what is going on with your cat. Lethargy – Cats in general are not as active as dogs and spend a lot of time sleeping. There is a difference between laziness and lethargy. Lethargy will make your cat look sick and they will not be interested in playing, eating, or drinking. Weight loss and appetite loss – A lot of cats are picky but if you notice your cat suddenly not eating at all there is a problem, especially if they are normally good eaters. If your cat skips several meals in a row or consistently goes off their food for several days there is something wrong and he or she needs to be checked. Hacking and Gagging with no hairballs resulting – If your cat is coughing a lot, gagging, or trying to vomit and nothing is being brought up from all this activity, your cat will need to take an immediate visit to the vet. The hairballs could be too big for the cat to cough up and that could be very dangerous for them. Frequent diarrhea or constipation – Your cat’s system will naturally try to eliminate the problem through its feces. If the hairball is too big you will notice that your cat have frequent constipation or diarrhea as it tries to eliminate the problem. Swollen stomach – if your cat has a blockage and it continues to get bigger you will notice a lump in the cat’s stomach or throat. If you see this, take them to the vet so the vet can help get rid of the problem. Although hairballs are a common occurrence among cats, the problems start when the hairballs are excessive. Prevention is always going to be the best course of action. The sooner you start them on a regular hairball prevention routine the healthier and better they are going to be. Once you start them on a product you should start to see an improvement in their overall health and well-being. With so many different remedies to try it can be really confusing trying to figure out which one to choose. The information in this guide will help you by offering detailed information on three of the top-rated hairball remedies as well as offering you symptoms and causes of hairballs in our buying guide. This knowledge will help you choose the right product, identify problems in your cat that could be hairballs and learn how to cope with the problem and help your cat through it.